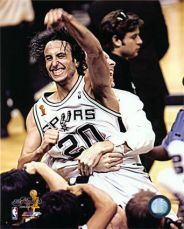 What shoes is Manu Ginobili wearing and where to buy them online. Note: This page features information about Manu Ginobili basketball shoes. We know that to buy online you have to be sure you are picking quality products and that you are shopping from recognized stores, with that on mind we have affiliated with the best online stores to recommend you where to get the basketball shoes of this NBA star, like FinishLine, Footlocker, eBay, Pro Sports Memorabilia and FansEdge among others (all with excellent customer service). All shoes are made by the leaders of the basketball shoe market: Nike, Reebok, Adidas and Converse.